So. Mr. Bebeh is getting older. What’s he up to these days? He’s just about to get the hang of running. But he’s also talking a lot. He also knows the sign for bird, which he uses a lot. I’m trying to teach him the sign for cow, but it’s a little tricky, since we don’t see that many cows on a day-to-day basis. He’s at a point, though, where if you ask him to try to repeat something, he stands a reasonable chance of making sounds that are at least marginally intelligible as the thing you’re trying to get him to say. Okay, maybe 30% of the time. He’s also a lot more willful than he used to be – he sees something and knows whether he wants it or not. Used to be he’d be pretty receptive to just about anything. Now, if he doesn’t want something, he’ll clearly say “no”. Not so successful with “yes” yet, but hey. Progress. He’s got some little shoes – they’re very minimal, so the soles are very thin, and they’re really flexible. He walks just about everywhere now, so we have to remember to put shoes on him when we go out, which is weirdly new(ish, it’s been about a month or two). He still likes banging on the Rock Band drums. He now stands on a little tower to watch us cook & clean in the kitchen. He mostly sleeps through the night, but there are some nights (like last night) where he wakes up a lot & gets really upset. Could be teething, as his last two bottom teeth are coming in. What a silly little fella. And yes, for a very brief moment, Mr. J was at GDC. 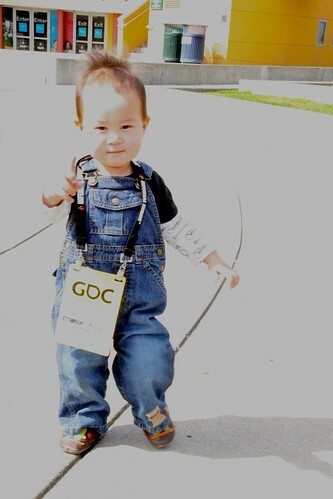 Which means he’s been to more GDC’s than probably 90% of the actual game industry. HA! You are currently browsing the six seven six blog archives for March, 2011.